At Willi's we are serious about wine. Good wine is a wonderful element to explore when you wish people to bond, exchange & interact. A dinner among friends or a team lunch; wine tasting or after work drinks; an anniversary or a farewell drink? Or an impromptu wedding celebration? We can assist you with all wine-related events. Serious, sentimental or both! We also offer Wine Workshops to aid your exploration of the connections between wine and art. Pauline Mouret will happily provide information and assist you in making your wine event come to life. Hidden at the back of Willi's, la Salle Colette is ideal for a morning meeting, a work lunch, a cocktail at our pop-up bar, or for a big dinner with a group of 20. Round tables for groups of 5, or a rectangle for a group of 16. 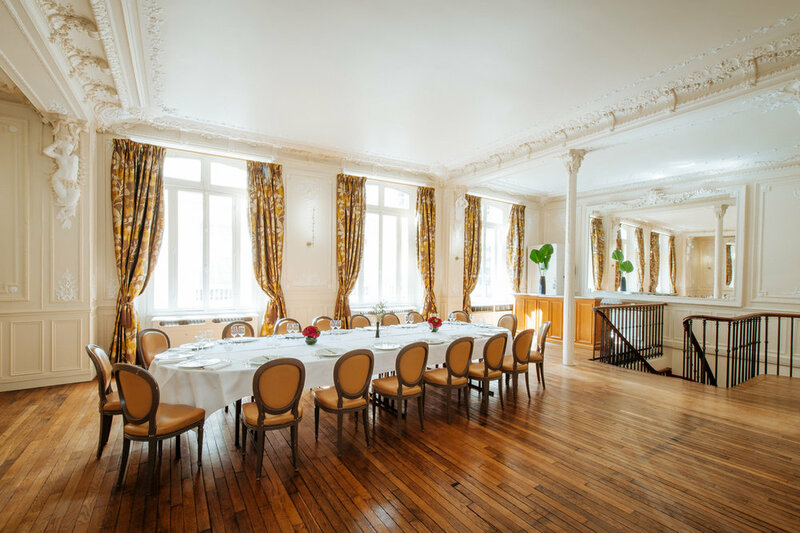 Our magnificent, light and discreet Salle de Bal is on the first floor of the restaurant Macéo, next to Willi's. With crown moldings laced around the ceiling, ornate, vast mirrors and grand south-facing windows, this room is truly exceptional. Perfect for a wedding reception, a press lunch, a cocktail party or even a themed dinner. The Salon Bar is ideal for an intimate evening 'Paulée' or a working lunch between challenging presentations.